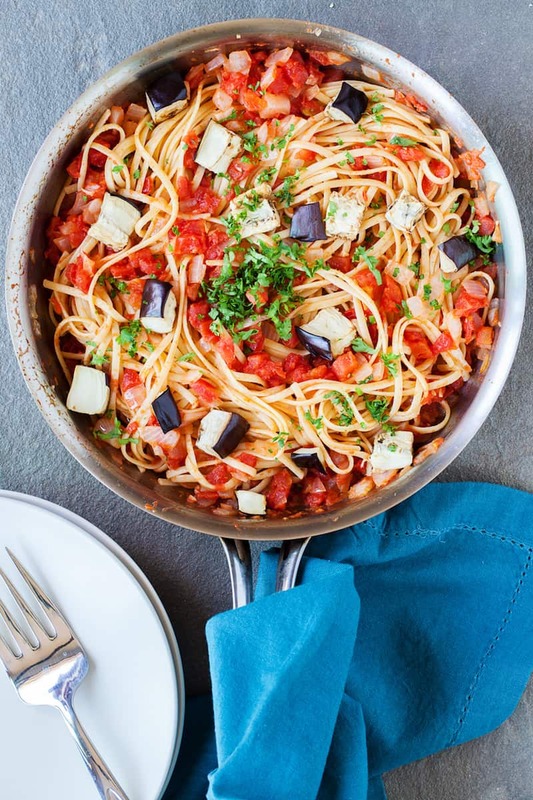 This delicious vegetarian linguine recipe combines fresh ingredients with garlic and tomatoes to make a dish that your whole family will love! 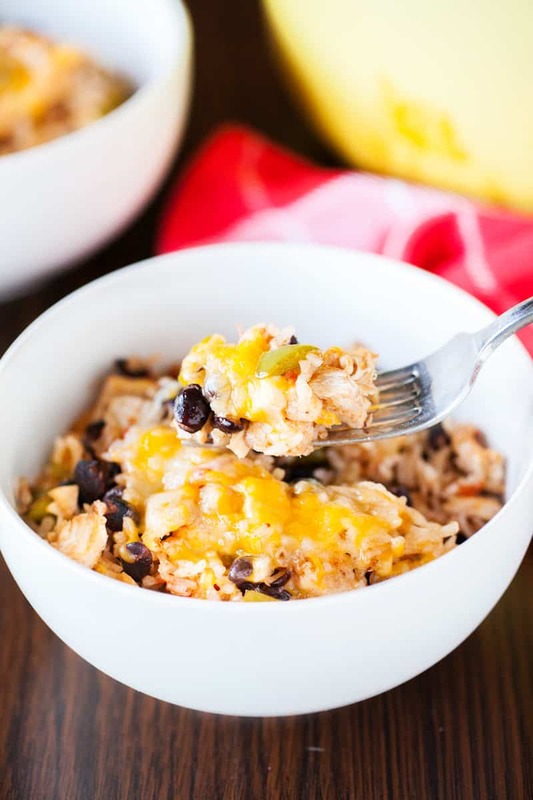 Lately I’ve been trying to make meals for my family that are both yummy and healthy. Buying spaghetti sauce in a jar just doesn’t cut it sometimes. Sure it’s easy and quick but what I really wanted to do was add chunky fresh vegetables with new flavors. It was my first time using eggplant and I have to admit, I was kinda nervous. That feeling didn’t last long. 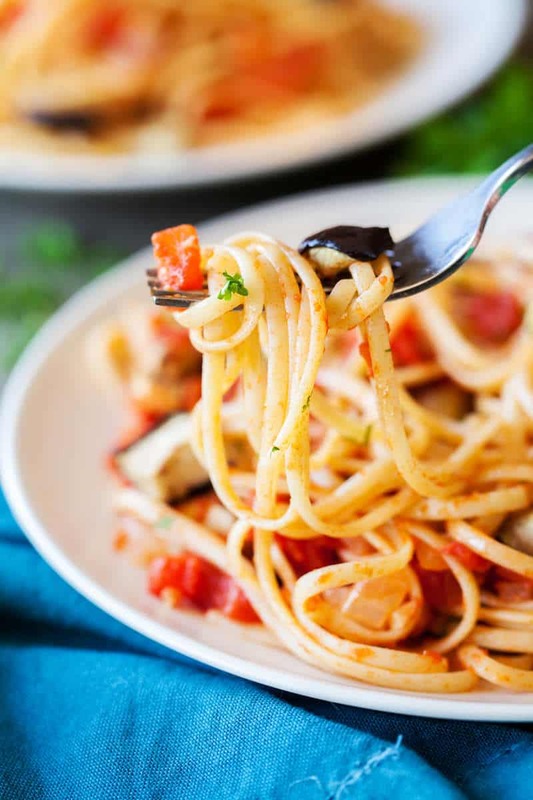 This vegetarian linguine recipe is bursting with deliciousness. It’s light and not heavy like regular spaghetti with meatballs can sometimes be. You can definitely use spaghetti in this recipe if you want to, but I highly recommend using linguine. Linguine is wider and flatter than spaghetti, and great for recipes like this one, where the ingredients/sauce are a bit more chunky. 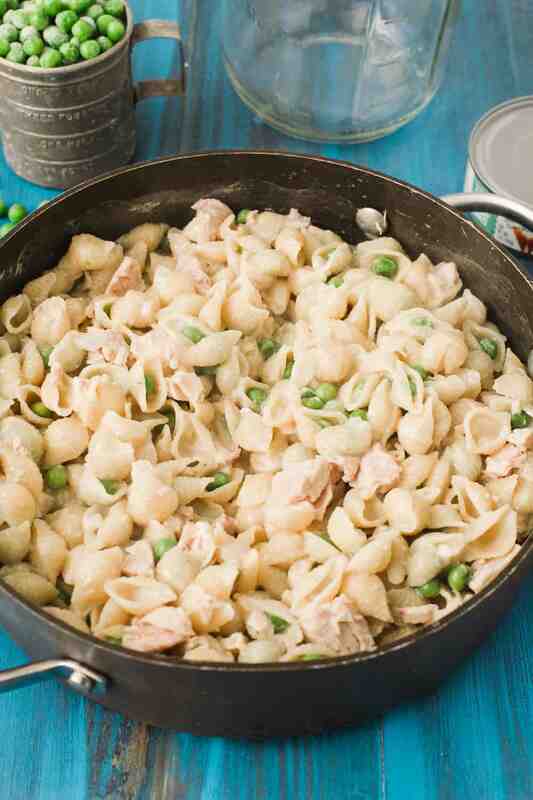 There are no rules to pasta – you can use any type of pasta with any type of sauce. However, I’m more of a traditionalist and I think to use the thicker pastas with the thicker sauces. 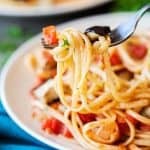 I’m a huge linguine fan and a huge fan of this vegetarian linguine recipe with the chunky sauce. I always heat about 4 quarts (16 cups) of water on the stove in a large pot, add some salt, and then bring it to a boil. Then I place the pasta into the water once it’s boiling and start the timer. With linguine, I check it after about 7 minutes and typically cook about 9 minutes. I visited Italy once and I’m a huge fan of “al dente” pasta. Basically, I don’t like it overcooked and prefer it to be a little firm. The firmness really adds to the awesomeness that is this vegetarian linguine. Once the noodles are done, drain them immediately. Never let pasta sit in the water on the stove because it’s going to continue to cook. Can you add meat to this easy linguine? Of course you can! The whole point of this vegetarian linguine is that it’s – vegetarian. 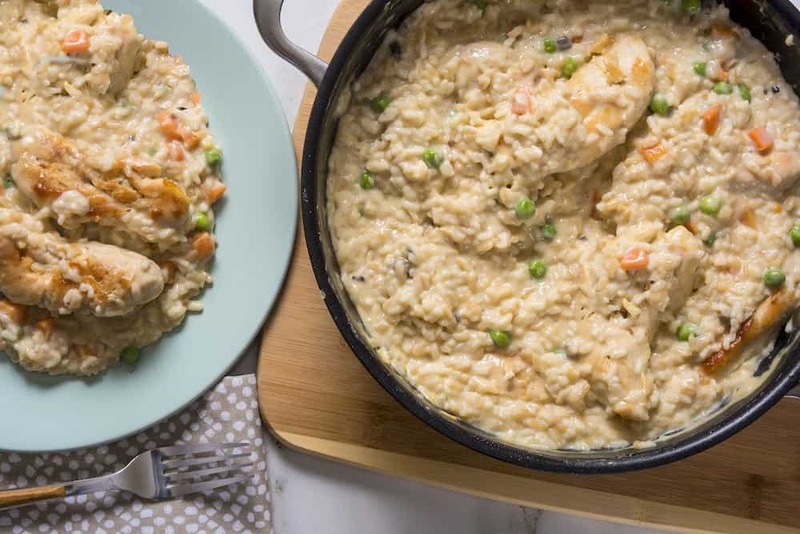 However, sometimes not everyone in the family appreciates a meat-free dish. If that’s the case, I recommend cooking Italian sausage in a separate pan so that those who are meat-atarians can toss it in with their linguine. It will taste delicious! 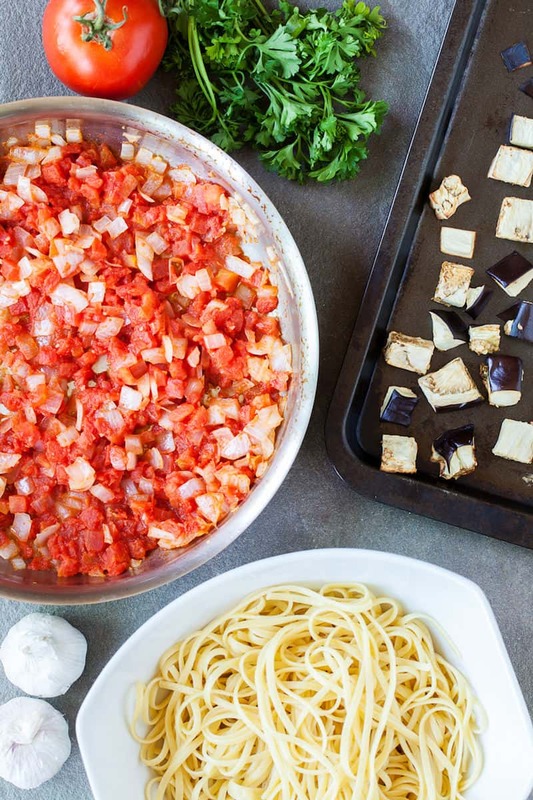 Are you ready to get this easy vegetarian linguine recipe? Keep reading. Preheat the oven to 425 degrees. Cut the eggplant into bite-sized pieces and toss with a dash of salt and 1 teaspoon of olive oil. Spray a baking pan with non-stick cooking spray and cook the eggplant for about 30 minutes or until the “meat” of the eggplant begins to brown. On medium heat, add the remaining olive oil to a large pan. Dice the onion, garlic and sun-dried tomatoes then add to the pan. Toast for about 5-10 minutes. Add the canned tomatoes and stir. Bring a medium saucepan of water to a boil, cooking the linguine until al dente. Drain the noodles and stir them right into the sauce. Add the cooked eggplant to the sauce and noodle mix. Serve this eggplant recipe immediately with a spoonful of the finely chop fresh parsley. Yum! 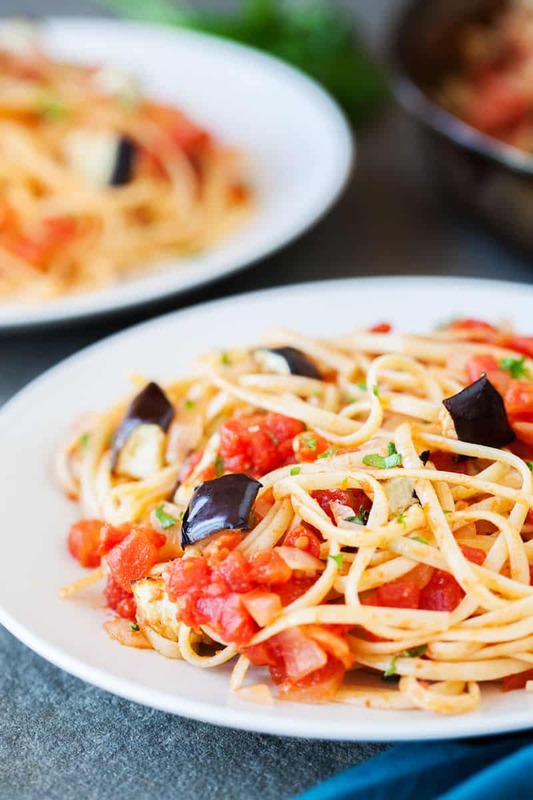 This delicious eggplant linguine recipe combines fresh ingredients with garlic and tomatoes to make a dish that your whole family will love! Cut the eggplant into bite-sized pieces and toss with a dash of salt and 1 teaspoon of olive oil. Spray a baking pan with non-stick cooking spray and cook the eggplant for about 30 minutes or until the “meat” of the eggplant begins to brown. On medium heat, add the remaining olive oil to a large pan. Dice the onion, garlic and sun-dried tomatoes then add to the pan. Toast for about 5-10 minutes. Add the canned tomatoes and stir. Add the cooked eggplant to the sauce and noodle mix. 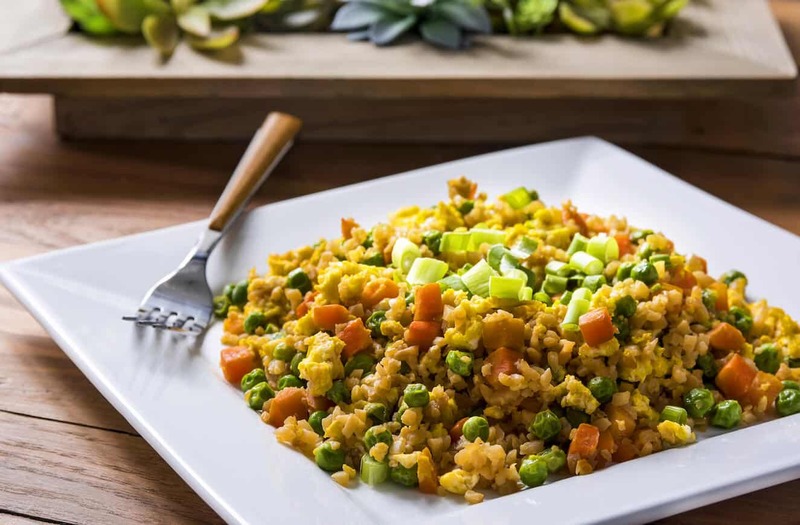 Serve immediately with a spoonful of the finely chop fresh parsley. Yum! If you like this linguine recipe, you’ll love these other pasta recipes!